Computex is currently taking place in Taiwan, and all the manufacturers are racing to impress with unique features. Asus is one of these companies that brought two new Zenbooks, both with impressive, although questionable ideas. The Zenbook Pro UX580 arrives with 15.6” 4K screen and a secondary 5.5” display, doubling as a touchpad. The ZenBook S is an ultra-light device of about 1 kg with a hinge that lifts the bottom part of the notebook when opened for ergonomic reasons. The ZenBook Pro 15 UX580 has Intel Core i9 processor and GTX 1050 Ti graphics card by Nvidia. RAM goes up to 16 GB, while storage can go as high as 1 TB SSD. The screenpad can be used either for detailed pinpointing of an element on the bigger display or as a secondary screen. The user interface allows a second window to be moved there and to be active while using the touchpad at the same time. This is a neat feature and time will tell if someone is going to use it or is Asus just flexing muscles. 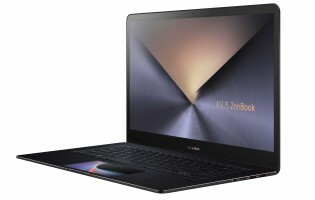 The ZenBook is arriving mid-July with a starting price of $2,299. The ZenBook S arrives with a light body, but with an unusual design solution that is most likely to bring wear marks to the edge of the notebook. 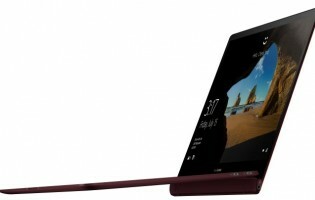 ASUS calls it ErgoLift hinge and says it is angled at 5.5 degrees for better cooling, ergonomics and audio performance. Arriving on June 11 from $1,199, this notebook comes with U-series Core i7 or i5 processors. The display is 13.3” in diagonal and has the option to be either 4K or 1080p with 85% screen-to-body ratio. Wondering if these get charged via USB C or proprietary port?